Martin Bellander, a doctoral candidate in psychology at the Karolinska Institutet in Stockholm, Sweden, has conducted a controversial experiment in which he concludes that blue is the most popular color in today’s art world. Without going into detail about his scientific process, Bellander used the BBC search browser to save and date thousands of artworks created between 1800 and the current day. He then categorized them according to medium (oil, acrylic, tempera or other/mixed media) and then analyzed the images. The images were separated by hue, saturation and value. Bellander then turned to math to create viable data and added the values of the paintings for that year together. Because analyzing every pixel of each painting would take quite some time and create discrepancies in the data, 100 random pixels were chosen. Then the missing paintings were counted and excluded from those that had already been analyzed. Final calculations were performed and then the data was plotted. The result of his foray into scientific art analysis is a wide, sweeping statement that seems to generalize the last 200 years of art making. Naysayers have claimed that the technology is inaccurate and Bellander’s process is unreliable. I, however, believe there is some validity in his conclusion. There is a logical scientific process to Bellander’s research. Yes, the experiment has to be replicated multiple times for his conclusions to be accepted in the art and science industries, but there is more than just scientific evidence here. The beauty of art is the fact that it is rooted in observation. The change in colors can be visually charted by the human eye. Even if modern technology had not been used at all, it is entirely possible that the change in color could have been noticed by viewers. Bellander presents four possible theories for the 20th century color shift in his blog. 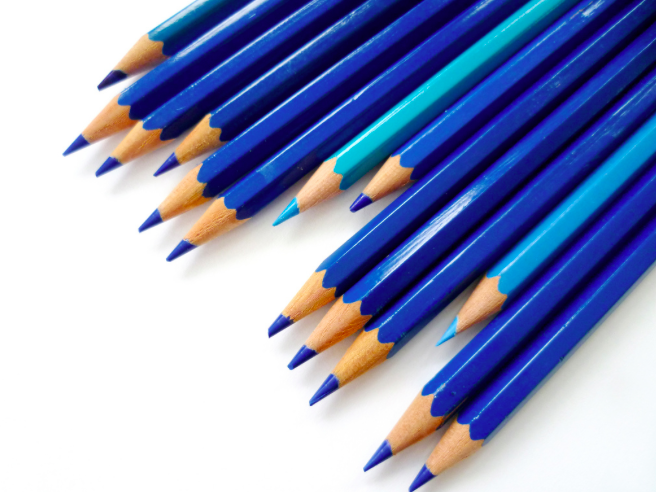 The first is that blue has just recently been recognized as a word for color. This idea is fascinating in that it examines the effects history and culture have had on the development of color theory and art. Bellander establishes, however, that it is the least likely explanation for the increasingly cooler paintings of the last two centuries. Another theory lies in the flaws of the technology he used. Dark or black colors often have blue in them or are tinted blue, which potentially caused the machine to read colors incorrectly. This is, again, unlikely. It is also possible that the colors have changed throughout time. Resins used in the paint will cause shifts in color as a painting ages. Lastly, blue was historically a very expensive pigment. As time passed and blue paint became cheaper and more accessible, it became more widely used. Bellander has also stated that there is a lot more research to be done and that, apart from orange, all of the colors increased in usage at least a little bit during this time period. I tend to think that the significant shift in blue is a combination of these factors, but the experiment itself raises other interesting questions. After seeing and acknowledging this shift in tone in paintings since the 1800s, I can’t help but wonder if it is now a self-perpetuating process. How set in stone are the tendencies toward bluer shades in our society? The last two centuries — those that Bellander studied — are extremely important in the history of art. The art that was produced is wide-ranging and radical. There was everything from neoclassicism to impressionism to futurism to cubism. Are artists today subconsciously using cooler colors because of their most recent and significant predecessors? Is the art world stuck in a rut of blue-based paintings until it reaches such a point that there is a backlash and warmer colors emerge once again? Regardless of the conclusions drawn and questions raised from this experiment, I applaud Bellander for adding something new to the conversations in the art world surrounding the evolution of color usage and theory. His conclusions are almost too broad and catch the eye of many people who are not at all interested in art, but that could be a good thing. He is prompting experts to further his research and attracting newer, wider audiences with issues that extend to language, culture and history.